Travel in Harmony with the Elements to the white continent. En route, you will experience the wild natural wonders of the chilean fjords. Once in Antarctica, the sight of mighty glaciers calving into the ocean, flocks of penguins and whales in the icy seas will create indelible memories. Hurigruten Expedition with cabin grade of your choice on a full board basis. One hotel right in Santiago de Chile before the voyage including breakfast. Transfer from hotel to airport in Santiago de Chile. Return economy flights from Santiago de Chile to Punta Arenas. 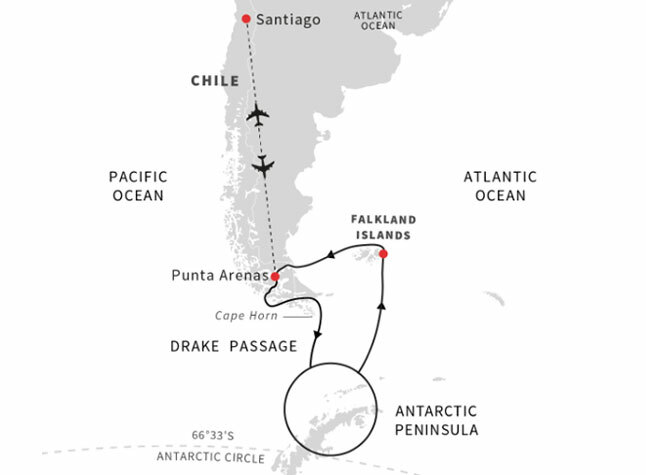 Transfers in Punta Arenas including an orientation tour. Wind and Water resistant jacket. Landings with small boats and activities on board and ashore. Professional English speaking expedition team that gives lectures as well as accompanying landings and activities. Prices are based on 2 people sharing an outside cabin and do not include flights. Free case of wine with every booking. Subject to availability. Terms & conditions apply.